the overwhelming majority of Londoners who are sick of encountering booze-fuelled unpleasantness when using buses or Tubes. Policing the new measure will not be easy - but the same was said when smoking was banned on public transport, when drink driving was made illegal and when the wearing of car seatbelts became compulsory. There were sound reasons of public health and safety behind these restrictions on personal freedoms but it was peer pressure that made them stick - and peer pressure can only kick in when the law is laid down, clearly and firmly. I feel somewhat schizophrenic about the measure. I could support a state crackdown on alcohol abuse that was systematic and enforced. This would entail raising the legal age (as in some US states), restricting sales to special outlets only (as in Canada), banning public drinking (as in parts of Wales and New Zealand), lowering the drink driving limit, raising taxes on alcohol, etc. 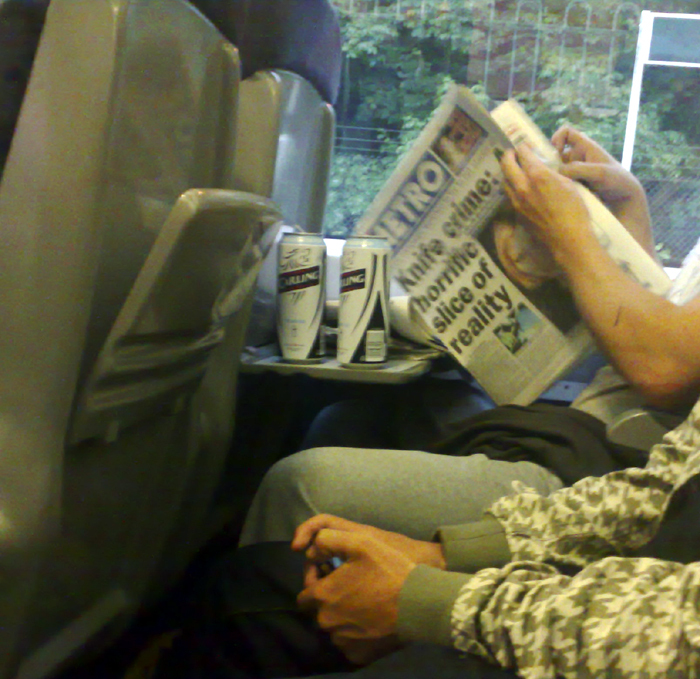 On the other hand, I was travelling on the train home earlier this week and struck by the man peacefully drinking his beer across the aisle from me (see photo above). He was bothering nobody with his vice. Incidentally, by the time I took this photograph we were out of London, which raises an interesting question. Does the ban only apply to London transport or to all transport originating in London? Does it apply to trains which pass through London (like the Thameslink service)? Would the attendants selling beer (and snacks) from trolleys on the London to Brighton line have to wait until they pass Croydon before selling their alcoholic wares? Did the new London Mayor think this one through? I also can’t help feeling that the new London Mayor is a hypocrite. Besides for the fact that he was a member of a student drinking club which specialises in trashing restaurants, he also claims to be a libertarian who regularly states how he is opposed to nanny-stateism and eye-catching PR initiatives that are unenforceable. He also promised to scrap the smoking ban. I have occasionally encountered drunk, aggressive and disorderly people on London transport, and seldom have the hooligans actually been drinking at the time. They were pre-tanked. Now the thing is that there are already laws against antisocial or aggressive drunken behaviour in public places. Wouldn’t the new London mayor have been better advised to introduce measures that would enforce existing regulations rather than simply add new ones? (Of course there are many supporters too). Tonight is the Last Orders on the Underground “protest party”. Full story here. See also Facebook event details which specify it is not a protest. A key which tells you which carriage to ride for the quickest exit/transfer at your destination station. My copy is well used. Another fun map (online only) is the Travel Time Tube Map. Select your station and it adjusts the layout showing the time it would take to other parts of the network. 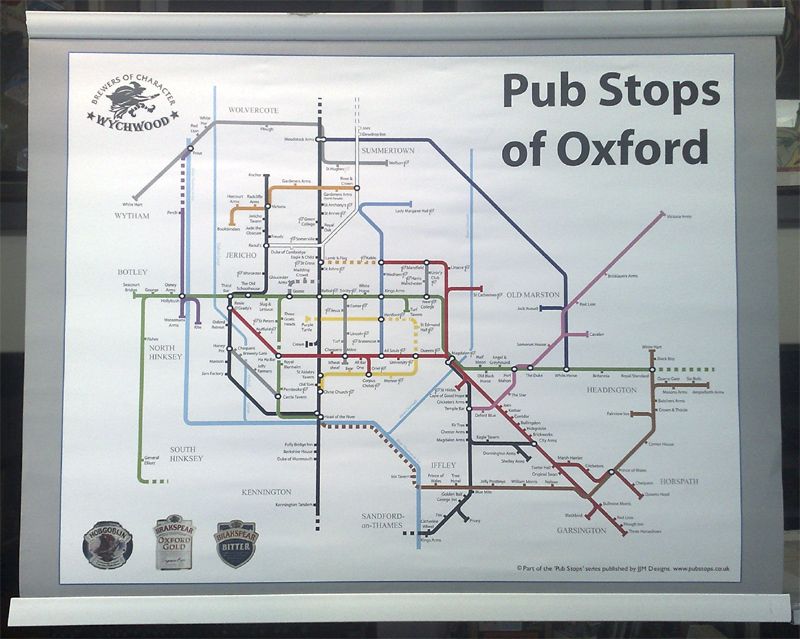 There are so many different maps of the London Underground these days. Annie Mole’s London Underground Blog is probably the best place to start looking at them. 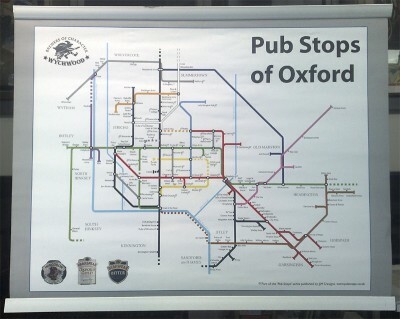 Some are just plain fun (like the What if Germany had won the war map), some are tributes (like the Oxford Pub map I photographed above) while some are more serious attempts to improve the classic tube map. Of the latter, I quite like the Curvy Tube Map which incorporates the “newer” tube lines and overground rail links in a coherent way. Additional Link: Tube Map Variations. It is generally believed that composer Richard Ashcroft wrote the song in response to the death of his father to cancer. In a 2006 study by Dr. Harry Witchel, The Drugs Don’t Work topped a list of songs that make people feel sad. Note: In light of recent developments North of the Scottish border I decided to resurrect this post, which I posted on 23 April 2007 but in a “closed” status so that it never appeared in the blog. I am adjusting the “posted date” to today, but please bear in mind that it was originally written 13 months ago. I was standing in the supermarket the other day, looking at the tobacco counter, and thinking I had spotted a hole in the UK anti-tobacco advertising legislation. Actual brands are banned from overt advertising displays. The exception is if they are less than an A5 size, 30% of which must contain government health warnings. 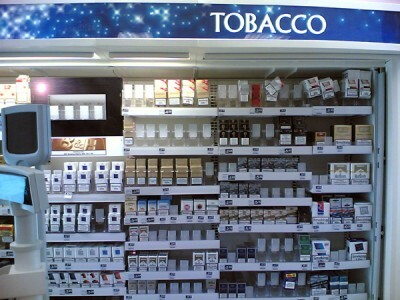 However the generic non-brand tobacco display (as per the above photograph) doesn’t have to contain the proportion of government health warning and is not limited in size. On 1 July the next step in the smoking clampdown kicks in with a ban on smoking in public places. Today the papers report that the British Medical Association is putting forward the next measures the government can take, focusing particularly on measures to make it more difficult for young people to buy cigarettes, and to focus on children who are subjected to second-hand smoke by their parents. potentially opening itself up to charges of undue interference in family life, but instead limited itself to calls for greater help for smokers wishing to give up. I think most smokers want to give up, but find it very difficult. If it’s not practical to make smoking in the car with your children illegal (perhaps there are questions of enforcement), then surely there’s a way to highlight the problems with this behaviour without being seen as “interfering in family life”? Isn’t a parent who smokes in the car with their babies in the back interfering with their lives? One way in which the supermarkets attempt to misinform consumers who would boycott Israeli product is to mislabel produce sourced from Israeli settlements. 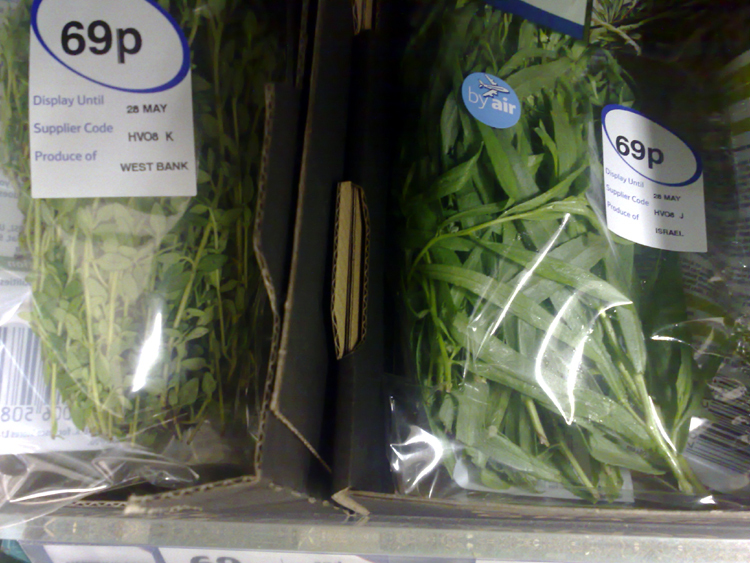 Waitrose admit that they label all produce from the occupied territories as ‘Produce of West Bank’,Goods carrying this label are almost certainly settlement goods not Palestinian goods. In a recent ITN report Sainsbury and Tesco’s, when confronted about this, admitted ‘mistakenly’ mislabelling settlement produce in the past and undertook to label settlement produce ’ West Bank ’ in the future. Labelling settlement produce ’ West Bank ’ misleads the consumer and denies them the choice between Palestinian goods (of which there are almost none) and settlement goods. It undermines the boycott movement by making Israeli and settlement goods harder to identify. There is also information in various articles on this boycott Selfridges page, on the Boycott Israel website and at the Big Campaign website. A bit of web-searching brings up the application in question. The date the application was received is given as 20/7/2007. The status of the application is Out to consultation and the consultation start and end dates are given as 12-Oct-2007 and 01-Nov-2007 respectively. A look through the minutes of meetings of the Surrey County Council Planning and Regulatory Committtee (and other committees) finds no mention of this application having been considered. 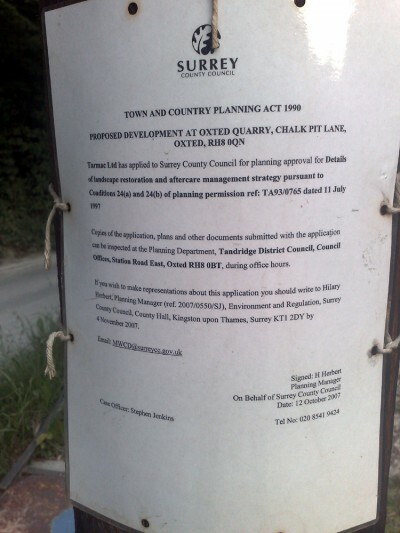 At the recent Tandridge District public meeting it was mentioned that there had been an amendment to the (long-term) planning approval of the quarry in 2006. 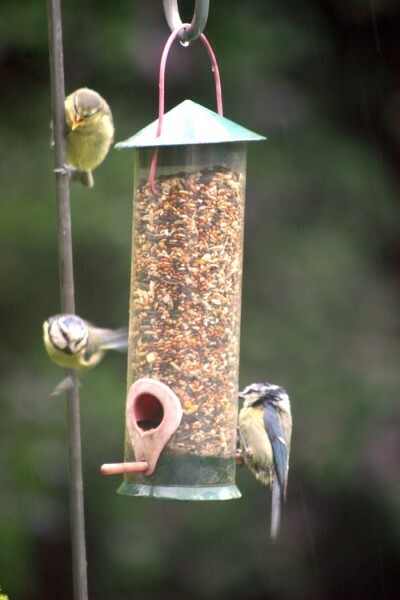 Strange then that there is no record of this on the Surrey County Council website? The Planning and Regulatory Committee of the Surrey County Council is chaired by the famous Pat “two votes” Frost of the Conservative Party. Two members of the women’s movement at the University of Cape Town in the mid-1980s went out spray-painting one night. After plastering the neighbourhood with their outrageous and witty graffiti they made their way back to their digs in buoyant mood. Sitting down with a cup of coffee a half-hour later they were surprised by the doorbell ringing. It was the wee hours of the morning, and they were even more surprised upon opening their front door to find two police officers standing on their doorstep. Fortunately for them their graffiti was about sexual politics (i.e. feminism) and the police did not see it as Political. That probably saved them from prosecution, plus the fact that they were white priviliged students and they immediately volunteered to clean it up. By daylight the next morning it was all gone. At that time it was dangerous to misunderestimate the apartheid police service. It was a brutal force which took its responsibilities to uphold “law and order” seriously. But its finer investigative and policing skills left a lot to be desired. What puzzled many was how these two young students managed to be caught so quickly? The answer was simple: The police followed them home. In their exuberance the activists had spray-painted every lamp post all the way back from the scene of the crime to their front door. What brought this story to mind? 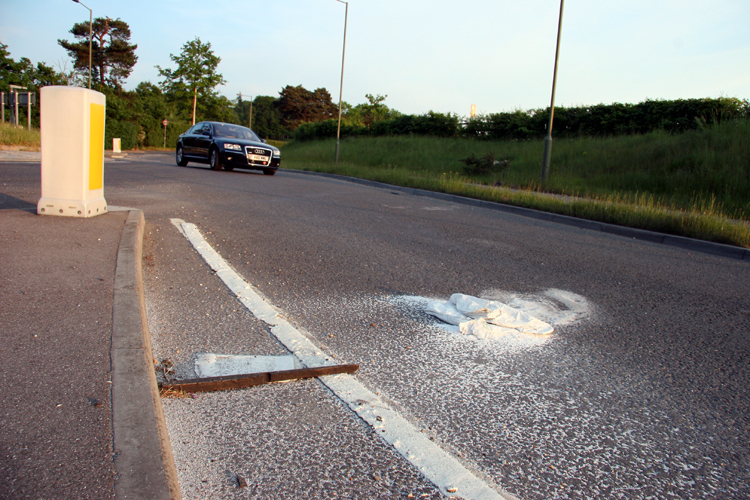 Over the past weeks I have noticed the trail of chalk/lime on the roads around Oxted. If you drive from Oxted along the A25 to Sevenoaks, you can notice this trail (which leads into Oxted) all the way from the M21. 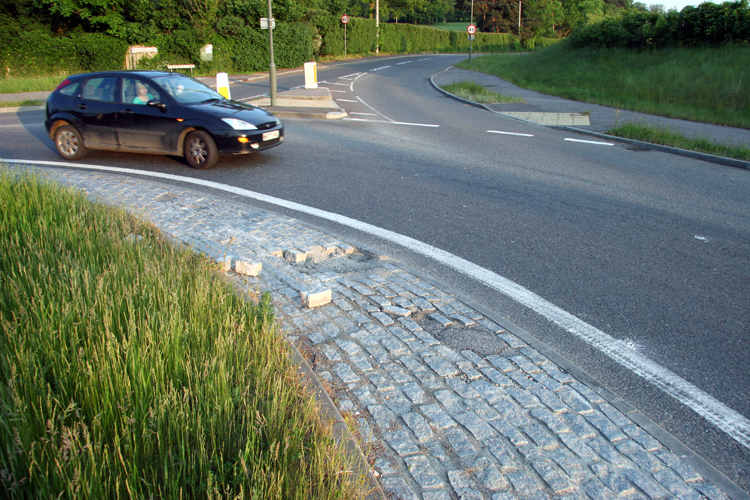 It also leads from the M25 at Junction 6 into Oxted. At various places there is damage to the roads. For example the damage to the Tandridge Hill roundabout that is visible in the above photograph. The circumstantial evidence suggests that this damage is caused by the same lorries that are spilling the chalk/lime on the roads. Often the damage corresponds with a noticeably large spillage. For instance the following photograph of spillage is taken within a few metres of the photograph above. I am not suggesting that the damage and spillage is occuring at precisely the same time (e.g. 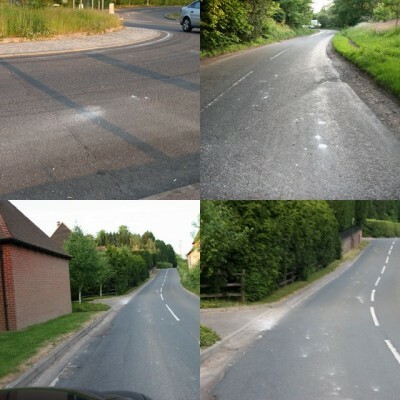 in the above example) but what is noticeable is that there are bits of spillage with every little pothole along these roads. I am simply pointing out that the road damage and spillage is mostly likely caused by the same 60 to 80 trucks that are rumbling up and down these roads every day. And ultimately my point is that one can follow the trail in the roads - the trail of damage and spillage. This evening I did just that, and here are some of the photographs showing how obvious this trail actually is. I wonder whether the local authorities - the Surrey County Council and Surrey Police - are intending to ring the doorbell at the Quarry site? Are they going to ask the company to sort out this mess, and will the company agree to comply forthwith? The failure of the quarry to ensure that only covered lorries are used. 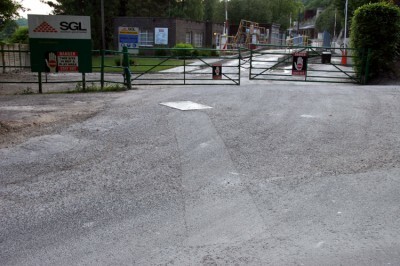 It was mentioned by Surrey Councillor Sally Marks (Conservative, Woldingham) at the recent public meeting that this is a condition of the current operations at the quarry.